The VaxArray Influenza Seasonal NA Potency test is a quantitative multiplexed immunoassay specific for seasonal NA subtypes, N1, N2 and B-NA. The test relies on broadly reactive yet subtype specific monoclonal antibodies in a microarray format. This innovative multiplexed system enables simultaneous analysis of all neuraminidase antigens within multivalent vaccines, significantly reducing cost and testing time. The VaxArray NA test exhibits excellent correlation with enzymatic activity and can be used as an easy alterative to enzymatic activity assays. When paired with appropriate calibration antigens, the kit can be used to quantify NA even in relatively complex media such as allantoic fluid or 40% sucrose. The VaxArray® Influenza Seasonal Neuraminidase (NA) Potency Test Kit contains 32 microarrays and most of the reagents needed to quantify N1, N2, and B NA from both B/Yamagata-like and B/Victoria-like viruses. The test is a multiplexed immunoassay in which a panel of monoclonal antibodies is used to capture subtype-specific antigen. Readout is based on fluorescence from an antigen-specific “label” antibody conjugated with a proprietary fluorophore. The arrangement of monoclonal capture antibodies within each microarray (i.e., within each well) is shown in the figure below. Subtype Specific and Multiplexed. Quantify any or all components of a quadrivalent formulation (note that B NA has not diverged for the two HA lineages). The microarray utilizes multiple antibodies for each subtype with 9 replicates per antibody in a single test, providing high confidence in results for protein quantification. Most Robust than Activity Assays. 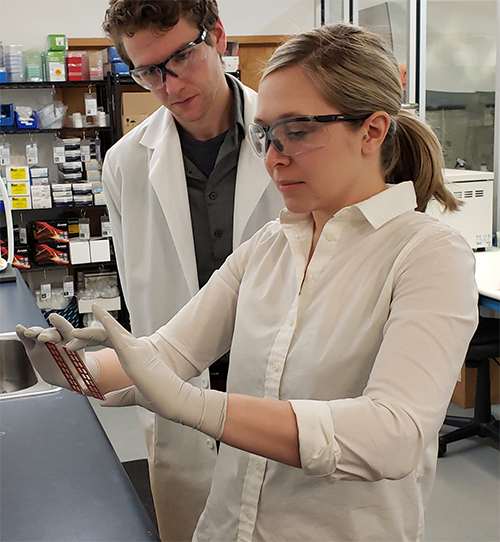 No need for finicky enzymes, the assay is conducted at room temperature and the quantification range is generally 10-100x larger than the typical range for enzymatic activity assays. Stability Indicating. The test has been demonstrated to quantify biologically relevant forms of NA. Compatibility with Adjuvants. NA quantification is robust even in the presence of common adjuvants at dose-sparing antigen concentrations. Off-the-Shelf Kit. Eliminates need for in-house preparation of plates or gels; streamlines testing. VaxArray users must select and order the appropriate fluor-tagged label antibody from the range offered by InDevR (see below for the anti-NA mAb list). In general, for egg-propagated flu vaccines we recommend the nearly universal polyclonal antibody (VXI-7616) for ease of use and broad applicability. For cell-propagated flu vaccines, recombinant proteins, or virus-like particles, it is recommend that you review the Label Selection Guide or, better yet, speak with our scientists about which label antibodies to try. It is sometimes necessary to experimentally evaluate a panel of label antibodies in order to optimize sensitivity. 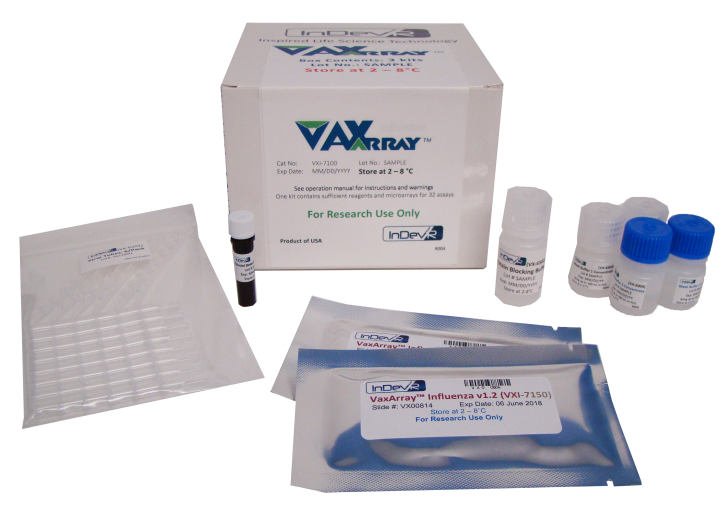 The VaxArray NA kit is manufactured under cGMP conditions within ISO 13485:2003 certified facilities. Refer to the literature tab for strain specific technical notes. 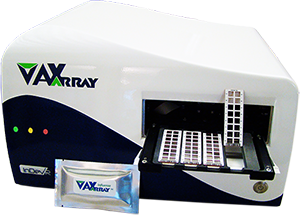 Dimensions, length x width x height - 17.25" x 13.5" x 10"
The VaxArray Microarray Imaging System was tested to conform with all CE standards, including the IEC 61010-1 (Ed. 2.0). Refer to the literature tab for the Declaration of Conformity.